I was pleasantly surprised last Friday to see that Paul Krugman took favorable notice of my post about sticky wages, but also registering some disagreement. [Glasner] is partially right in suggesting that there has been a bit of a role reversal regarding the role of sticky wages in recessions: Keynes asserted that wage flexibility would not help, but Keynes’s self-proclaimed heirs ended up putting downward nominal wage rigidity at the core of their analysis. By the way, this didn’t start with the New Keynesians; way back in the 1940s Franco Modigliani had already taught us to think that everything depended on M/w, the ratio of the money supply to the wage rate. That said, wage stickiness plays a bigger role in The General Theory — and in modern discussions that are consistent with what Keynes said — than Glasner indicates. To document his assertion about Keynes, Krugman quotes a passage from the General Theory in which Keynes seems to suggest that in the nineteenth century inflexible wages were partially compensated for by price level movements. One might quibble with Krugman’s interpretation, but the payoff doesn’t seem worth the effort. But I will quibble with the next paragraph in Krugman’s post. But there’s another point: even if you don’t think wage flexibility would help in our current situation (and like Keynes, I think it wouldn’t), Keynesians still need a sticky-wage story to make the facts consistent with involuntary unemployment. For if wages were flexible, an excess supply of labor should be reflected in ever-falling wages. If you want to say that we have lots of willing workers unable to find jobs — as opposed to moochers not really seeking work because they’re cradled in Paul Ryan’s hammock — you have to have a story about why wages aren’t falling. Not that I really disagree with Krugman that the behavior of wages since the 2008 downturn is consistent with some stickiness in wages. Nevertheless, it is still not necessarily the case that, if wages were flexible, an excess supply of labor would lead to ever-falling wages. In a search model of unemployment, if workers are expecting wages to rise every year at a 3% rate, and instead wages rise at only a 1% rate, the model predicts that unemployment will rise, and will continue to rise (or at least not return to the natural rate) as long as observed wages did not increase as fast as workers were expecting wages to rise. Presumably over time, wage expectations would adjust to a new lower rate of increase, but there is no guarantee that the transition would be speedy. So sticky wages are an important part of both old and new Keynesian analysis, not because wage cuts would help us, but simply to make sense of what we see. My own view is actually a bit more guarded. I think that “sticky wages” is simply a name that we apply to a problematic phenomenon for ehich we still haven’t found a really satisfactory explanation for. Search models, for all their theoretical elegance, simply can’t explain the observed process by which unemployment rises during recessions, i.e., by layoffs and a lack of job openings rather than an increase in quits and refused offers, as search models imply. The suggestion in my earlier post was intended to offer a possible basis of understanding what the phrase “sticky wages” is actually describing. Roger Farmer, a long-time and renowned UCLA economist, also commented on my post on his new blog. Welcome to the blogosphere, Roger. Roger has a different take on the sticky-wage phenomenon. Roger argues, as did some of the commenters to my post, that wages are not sticky. 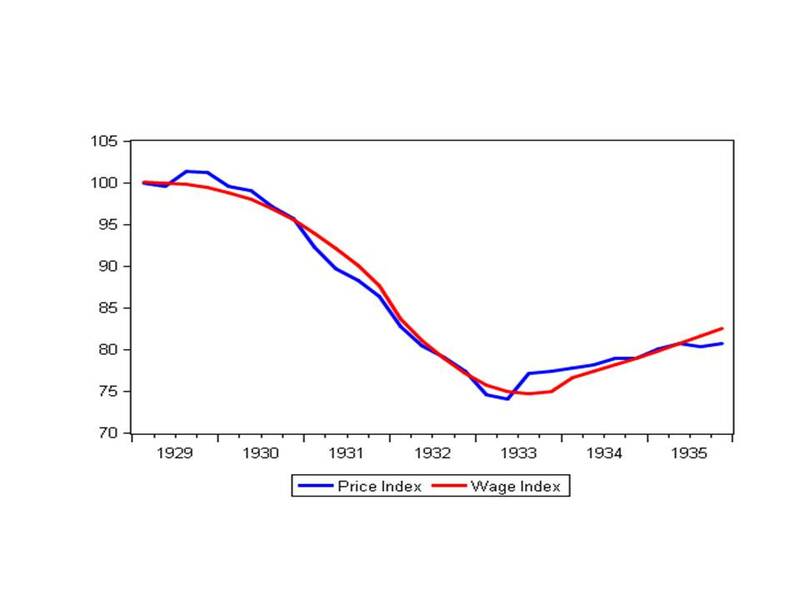 To document this assertion, Roger presents a diagram showing that the decline of nominal wages closely tracked that of prices for the first six years of the Great Depression. From this evidence Roger concludes that nominal wage rigidity is not the cause of rising unemployment during the Great Depression, and presumably, not the cause of rising unemployment in the Little Depression. Instead, Roger argues, the rise in unemployment was caused by an outbreak of self-fulfilling pessimism. Roger believes that there are many alternative equilibria and which equilibrium (actually equilibrium time path) we reach depends on what our expectations are. Roger also believes that our expectations are rational, so that we get what we expect, as he succinctly phrases it “beliefs are fundamental.” I have a lot of sympathy for this way of looking at the economy. In fact one of the early posts on this blog was entitled “Expectations are Fundamental.” But as I have explained in other posts, I am not so sure that expectations are rational in any useful sense, because I think that individual expectations diverge. I don’t think that there is a single way of looking at reality. If there are many potential equilibria, why should everyone expect the same equilibrium. I can be an optimist, and you can be a pessimist. If we agreed, we would be right, but if we disagree, we will both be wrong. What economic mechanism is there to reconcile our expectations? In a world in which expectations diverge — a world of temporary equilibrium — there can be cumulative output reductions that get propagated across the economy as each sector fails to produce its maximum potential output, thereby reducing the demand for the output of other sectors to which it is linked. That’s what happens when there is trading at prices that don’t correspond to the full optimum equilibrium solution. So I agree with Roger in part, but I think that the coordination problem is (at least potentially) more serious than he imagines.